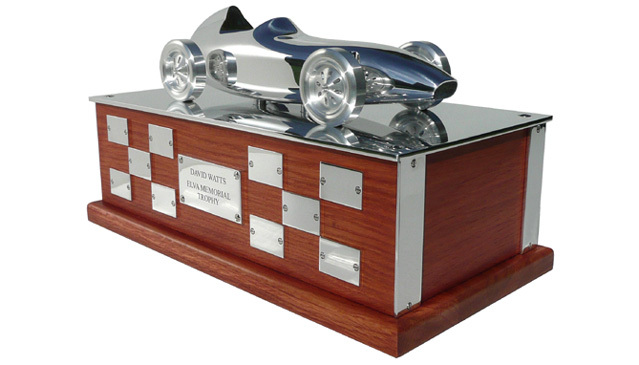 This British Formula Junior Historical Championship Trophy is a 1959 ELVA racer sculpted in an hiduminium billet, polished, and set on an oak base. This one off piece will be set into play every year, and the chequered face will be, year after year, engraved with winner's names. DE CLERCQ has made numerous World Championship and Formula One Grand-Prix Trophies, using its full experience in silversmith and sculpture craftsmanship. We have done, too, with an equal care, more modest pieces, giving proof a fine trophy, made accordingly to rules of the art, is not reserved for the more prestigious competitions.